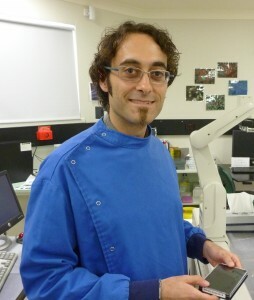 Biography: Leonardo joined the Discovery Biology team in 2011, where he has developed High-Throughput screening assays for the identification of compounds with inhibitory activity against all stages of Plasmodium falciparum gametocytogenesis and female gamete formation and screened tens of thousands of compounds. Leonardo is currently working on multiple hit-to-lead and lead-op projects funded by the Japanese Global Health Innovative Technology Fund (GHIT), in collaboration with the Medicine for Malaria Venture (MMV), as well as various academic collaborations. Robertson LP, Lucantoni L, Duffy S, Avery VM and Carroll AR. (2019) Acrotrione: An Oxidized Xanthene from the Roots of Acronychia pubescens. Journal of Natural Products. Mar 13 [Epub ahead of print] PMID: 30865443. Xue L, Shi DH, Harjani JR, Huang F, Beveridge J, Dingjan T, Ban K, Diab S, Duffy S, Lucantoni L, Fletcher S, Chiu FCK, Blundell SA, Ellis K, Ralph SA, Wirjanata G, Teguh S, Noviyanti R, Chavchich M, Creek DJ, Price R, Marfurt J, Charman SA, Cuellar M, Strasser J, Dahlin J, Walters MA, Edstein M, Avery VM and Baell JB. (2019) 3,3’-Disubstituted 5,5’-Bi(1,2,4-triazine) derivatives with Potent in vitro and in vivo Antimalarial Activity. Journal of Medicinal Chemistry. Mar 14; 62(5): 2485-2498. Vinh NB, Drinkwater N, Malcolm TR, Kassiou M, Lucantoni L, Grin PM, Butler GS, Duffy S, Overall CM, Avery VM, Scammells PJ and McGowan S. (2019) Hydroxamic Acid Inhibitors Provide Cross-Species Inhibition of Plasmodium M1 and M17 Aminopeptidases. Journal of Medicinal Chemistry. 62(2): 622-640. Butler NM, Hendra R, Bremner JB, Willis AC, Lucantoni L, Avery VM and Keller PA. (2018) Cascade reactions of indigo with oxiranes and aziridines: efficient access to dihydropyrazinodiindoles and spiro-oxazocinodiindoles. Organic & Biomolecular Chemistry. Aug 22; 16(33): 6006-6016. Senadeera SPD, Lucantoni L, Duffy S, Avery VM, Carroll AR. (2018) Antiplasmodial β-Triketone-Flavanone Hybrids from the Flowers of the Australian Tree Corymbia torelliana. Journal of Natural Products. 27; 81(7): 1588-1597. Buedenbender L, Robertson LP, Lucantoni L, Avery VM, Kurtböke Dİ, and Carroll AR. (2018) HSQC-TOCSY Fingerprinting-Directed Discovery of Antiplasmodial Polyketides from the Marine Ascidian-Derived Streptomyces sp. (USC-16018). Marine Drugs. May 30; 16(6): 189. Vanaerschot M, Lucantoni L, Li T, Combrinck JM, Ruecker A, Kumar TRS, Rubiano K, Ferreira PE, Siciliano G, Gulati S, Henrich PP, Ng CL, Murithi JM, Corey VC, Duffy S, Lieberman OJ, Veiga MI, Sinden RE, Alano P, Delves MJ, Lee Sim K, Winzeler EA, Egan TJ, Hoffman SL, Avery VM and Fidock DA. (2017) Hexahydroquinolines are antimalarial candidates with potent blood-stage and transmission-blocking activity. Nature Microbiology. Aug 14; 2: 1403–1414. Weidner T, Lucantoni L, Nasereddin A, Preu L, Jones PG, Dzikowski R, Avery VM & Kunick C. (2017) Antiplasmodial dihetarylthioethers target the coenzyme A synthesis pathway in Plasmodium falciparum erythrocytes stages. Malaria Journal. May 15; 16(1): 192. Lucantoni L, Loganathan S and Avery VM. (2017) The need to compare: assessing the level of agreement of three high-throughput assays against Plasmodium falciparum mature gametocytes. NATURE Scientific Reports. Apr 5; 7: 45992. Pegoraro S, Duffey M, Otto TD, Wang Y, Rösemann R, Baumgartner R, Fehler SK, Lucantoni L, Avery VM, Moreno-Sabater A, Mazier D, Vial HJ, Strobl S, Sanchez CP and Lanzer M. (2017) SC83288 is a clinical development candidate for the treatment of severe malaria. Nature Communications. Jan 31; 8: 14193. Fletcher S, Lucantoni L, Sykes ML, Jones AJ, Holleran JP, Saliba KJ and Avery VM. (2016) Biological characterization of chemically diverse compounds targeting the Plasmodium falciparum coenzyme A synthesis pathway. Parasites & Vectors. Nov 17; 9(1): 589. Van Voorhis WC, Avery VM, Duffy S, Lucantoni L, Poulsen SA et al. (2016) Open Source Drug Discovery with the Malaria Box Compound Collection for Neglected Diseases and Beyond. PLOS Pathogens. Jul 28; 12(7): e1005763. Lucantoni L, Fidock D and Avery VM. (2016) Luciferase-Based, High-Throughput Assay For Screening And Profiling Transmission-Blocking Compounds Against Plasmodium falciparum Gametocytes. Antimicrobial Agents and Chemotherapy. Mar 25; 60(4): 2097-2107. Lucantoni L, Silvestrini F, Signore M, Siciliano G, Eldering M, Dechering KJ, Avery VM and P Alano. (2015) A simple and predictive phenotypic High Content Imaging assay for Plasmodium falciparum mature gametocytes to identify malaria transmission blocking compounds. Scientific Reports. Nov 10; 5: 16414. Lucantoni L, Duffy S., Adjalley SH, Fidock SA, Avery, VM. (2013) Identification of MMV Malaria Box inhibitors of Plasmodium falciparum early-stage gametocytes, using a luciferase-based high-throughput assay. Antimicrob Agents Chemother. Dec; 57(12): 6050-6062. Teguh SC, Klonis N, Duffy S, Lucantoni L, Avery VM, Hutton CA, Baell JB, Tilley L. (2013) Novel conjugated quinoline-indoles compromise Plasmodium falciparum mitochondrial function and show promising antimalarial activity. Journal of Medicinal Chemistry. 2013 Aug 8; 56(15): 6200-6215. Lucantoni L, Avery MV (2012) Whole-cell in vitro screening for gametocytocidal compounds. Future Medicinal Chemistry. [Invited review] 2012 December; 4(18): 2337-2360. Chief Investigator, Griffith University New Researcher Grant (2013). Habluetzel A, Lucantoni L, Esposito F (2009). Azadirachta indica as a public health tool for the control of malaria & other vector-borne diseases. Indian Journal of Medical Research 130(2):112-114. Habluetzel A, Carnevali F, Lucantoni L, Grana L, Attili AR, Archilei F, Antonini M, Valbonesi A, Abbadessa V, Esposito F, van der Esch SA (2007). Impact of the botanical insecticide Neem Azal® on survival and reproduction of the biting louse Damalinia limbata on angora goats. Veterinary Parasitology 144: 328-337. Lucantoni L, Giusti F, Cristofaro M, Pasqualini L, Esposito F, Lupetti P, Habluetzel A (2006). Effects of a neem extract on blood feeding, oviposition and oocyte ultrastructure in Anopheles stephensi Liston (Diptera: Culicidae). Tissue & Cell 38:361-371. Italian patent application No. RM2010A000524 (08.10.2010). Composition comprising a photoactivatable larvicide.